Leeds Metropolitan University has become Leeds Beckett University! For reasons unbeknownst to us mere mortals, Leeds Metropolitan University changed its name to Leeds Beckett University, with effect from September 2014. I spent a happy year at Leeds Met doing my M.A. in ELT and Delta, between 2012 and 2013, and for me it will always be Leeds Met. However, nostalgia aside, usefully enough, I have now finally updated all the links in my blog that used to lead to Leeds Metropolitan’s M.A ELT/Delta page so that they now point in the brand new direction of Leeds Beckett University’s M.A. ELT/Delta page. I can assure you, it was a very dull labour of love. Worth it though, as the good news is, the only thing that’s changed is the name: the M.A. ELT department is still kept going by the same lovely team of tutors who were at the helm while I was there. I’m not, though, going to change all mentions of Leeds Met, in various blog posts and pages, to Leeds Beckett, as it was Leeds Met when I was there, but at least now, should you be so inclined, you can follow links to more information about the course I did without reaching a dead end! 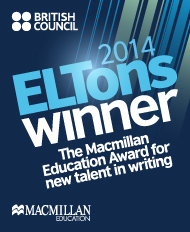 My top ten ELT books – how many have you read? Faced with the hundreds of ELT-related books there are out there, an oft-repeated question, when teachers want to learn more about their profession and develop themselves as educators, is “What should I read first?”. Here is a list of books that I believe you can’t go wrong with. I have made the list deliberately wide-ranging in terms of what is covered (i.e. 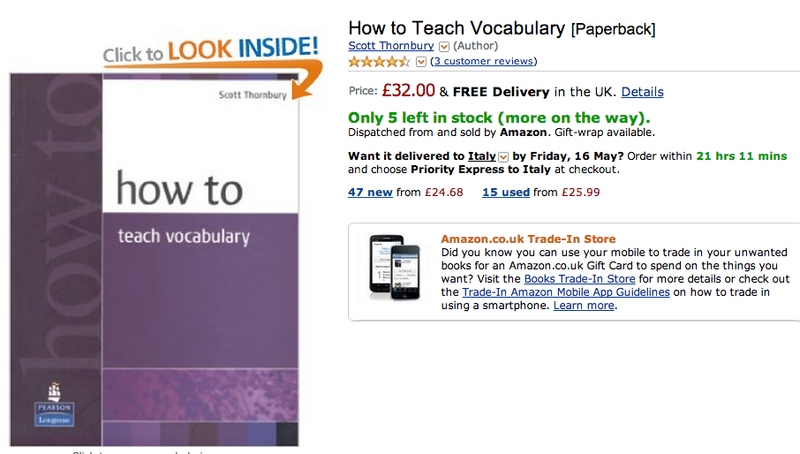 it’s not a list of ten vocabulary-related books! ), again slightly stretching the concept of “top ten” with a little bit of grouping! NB, I am not on commission! Also, I do not condone downloading any of these for free from any online sources. Some of them are available as e-books but you still have to pay! I do recommend checking if your school has them available to borrow. If your school is a CELTA (or equivalent) or a Delta (or equivalent) centre, then it is very likely to do so, and even if it isn’t, it may have acquired a few books that it makes available for teachers to borrow. University libraries (if the university does any ELT/TESOL/Applied linguistics type degrees) are good place to try too, if you can get access. 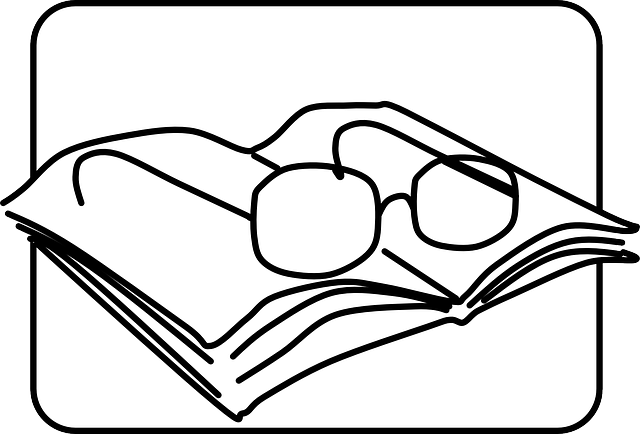 Initial teacher training courses tend to have a core text that trainees are required to buy and from which various portions are set as compulsory reading. For me, that was Learning Teaching (though this was pre-inclusion of free DVD). 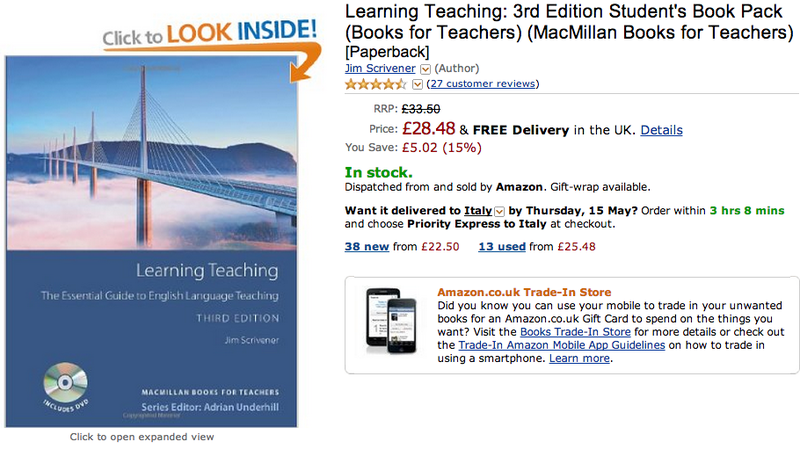 The usual alternative is The Practice of English Language Teaching by Jeremy Harmer. Either of these two general methodology books are a great starting point for a novice teacher – or an experienced teacher looking to refresh their memory. I’ve read both from cover to cover. 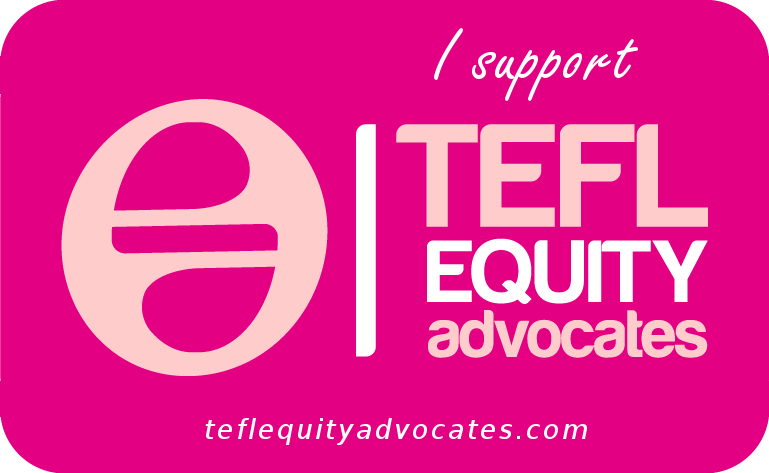 I also dipped into Learning Teaching extensively in my first post-qualification year of teaching. 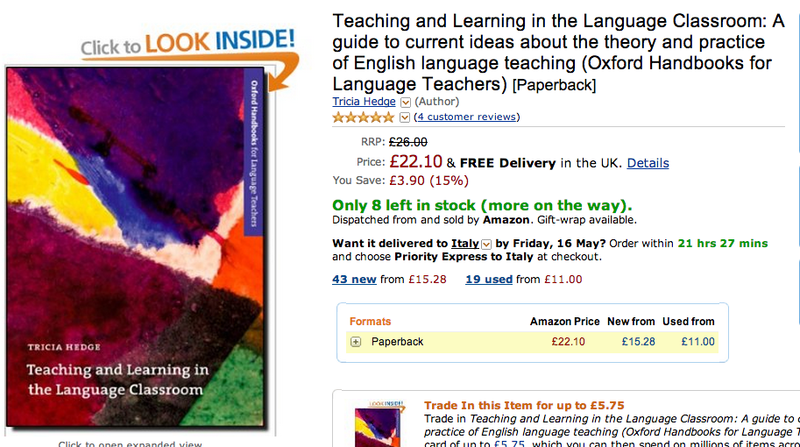 They give you a good overview of the many different elements that come together to make up language teaching. I’ve chosen Learning Teaching over The Practice of English Language Teaching to list here on a purely subjective basis: I found it more readable. I’m sure there are people who will read this post who would staunchly argue the reverse. My advice would be, take your pick – you can’t go wrong with either! How is your language awareness? By this I don’t just mean are you a grammar genius. What about discourse? lexis? Phonology? I didn’t use this book until I was preparing for my Delta but I firmly believe that all language teachers should make their way through it at some point. The great thing about it is that it doesn’t just describe things, it makes you do hundreds of tasks (for which the answer keys are at the back of the book) so you can test your understanding of what is being discussed. Why not do ten or fifteen minutes on a regular basis as part of your continued professional development? This gem of a book was in close competition with John Field’s Listening in the language classroom but won its place on the list by combining its extensive treatment of teaching listening with discussion of metacognition and how to integrate development of metacognitive awareness into listening pedagogy. It has a strong theoretical thread running all the way through, but manages to be very readable as well as containing plenty of very practical ideas for implementing the theories discussed. I’ve read both Vandergrift&Goh and Field from cover to cover, as well as dipping into them repeatedly since, both are well worth investing in and reading. How languages are learned is an accessible introduction to the theories behind first and second language acquisition. As teachers of language, it is helpful for us to have an understanding of theories surrounding learning and acquisition, as these have informed the approaches, methodologies and teaching techniques that evolved over the course of time. This book is good because as well as discussing a wide range of FLA and SLA theories, it encourages reflection on the topics discussed through the reflective questions that punctuate it at the end of every chapter. There are also activities that you can do to explore topics further. I read this book in preparation for Delta but I think there’s no need to wait until you are doing such a qualification before you open it. Another Scott Thornbury gem – his name features rather heavily in this list, I’m afraid! 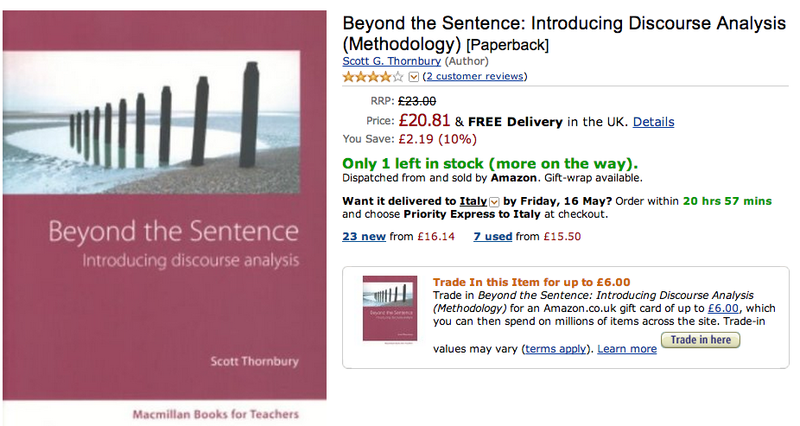 – Beyond the sentence is a great introduction to discourse analysis. Each chapter has a corresponding task, for which there is an answer key, to focus you on the main points of what has been discussed and get your brain zooming out from individual grammar and lexical items to think in discourse terms. The activities are readily adaptable for use with students. A lot of of the lexical and grammatical choices we make are down to the influence of language we use not existing in a vacuum but as discourse, so it is worth learning about how discourse works. It makes more useful pre-Delta reading, and whether or not you plan on doing the qualification, is worth spending time on. 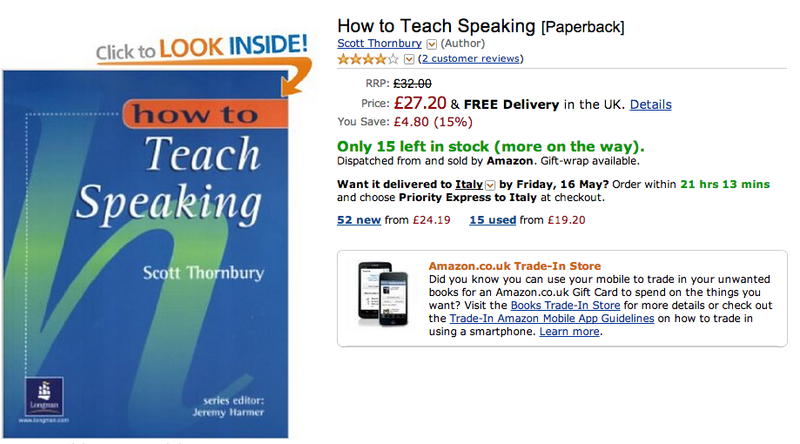 How to teach speaking doesn’t actually look like that anymore – now it’s a green version of How to teach vocabulary! Both are really great in terms of being very readable and combining theory with practice, in terms of giving you lots of ideas to try out, as well as the rationale behind them. I read them both cover to cover before starting Delta and found they gave me a really good grounding, which I was able to build on with more in-depth theoretical stuff when it came to essay-writing. Both highly recommended whether or not you intend to go on and do a further qualification. This book is fascinating. It analyses conversation, taking it apart and explaining how it works, why and how we do what we do when we speak, as well as looking at the implications of this for language teaching. Not a whizz-bang of activities to deploy following a five minute flick through, but well worth making the effort of sitting down and reading it, to expand your understanding of how conversation works. This is another book I didn’t discover until I was doing my Delta – the library had multiple copies so I had one out while preparing my LSA4 on speaking, but again merits not being consigned only to being read by Delta/equivalent trainees! This was one of the first books I read (apart from Learning Teaching) post-CELTA. I happened upon it in the teachers’ library at my second school. 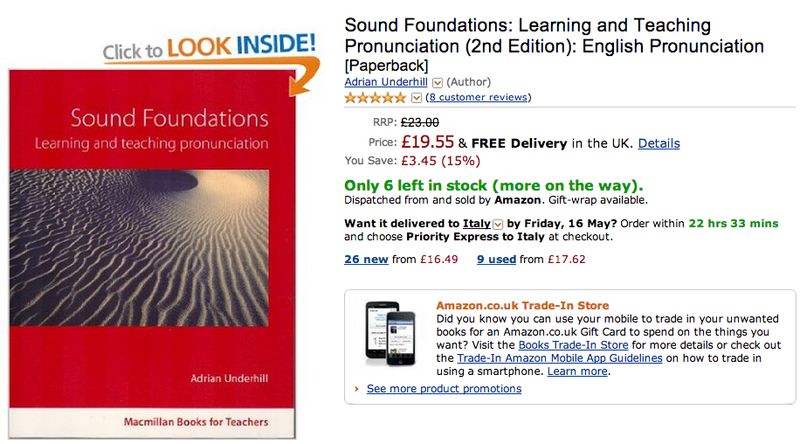 It absolutely revolutionised my understanding and teaching of pronunciation. 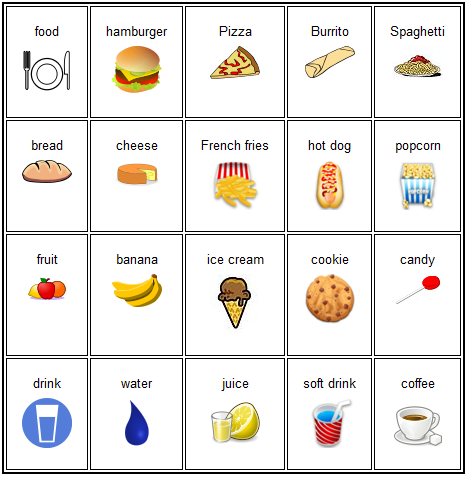 That was also when I learnt about phonemic symbols and used to practice writing with them. Then it turned out that it was very useful to have already read the book and processed it, as well as having learnt the symbols, prior to starting Delta, as I had a good knowledge base to take in with me. However, it is definitely recommended regardless of your further qualification plans, in order to extend your pronunciation teaching skills. It contains theory written in easily understandable language, as well as lots of discovery tasks to help you understand how sounds work and lots of activities you can take into the classroom with you too. This is another more general book, and its strong points are that it goes into reasonable depth on a range of things, including course design and assessment, learner autonomy and so on, as well as the treatment of the more obvious elements like teaching the skills (reading/writing/speaking/listening), grammar, vocabulary and pronunciation. It is a good, solid all-rounder to have at your finger tips. It also sports “further reading” lists at the end of each section, which are a great place to start if you are looking to explore something further and increase your depth of knowledge and understanding with regards to that topic. 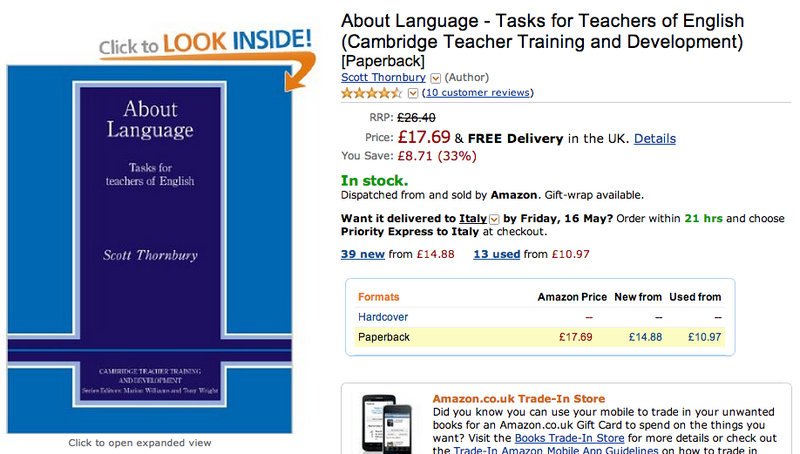 As well as this list of books, every self-respecting language teacher should have (access to) a good grammar book. This will probably have been written by someone with a surname that is also an animal. E.g. 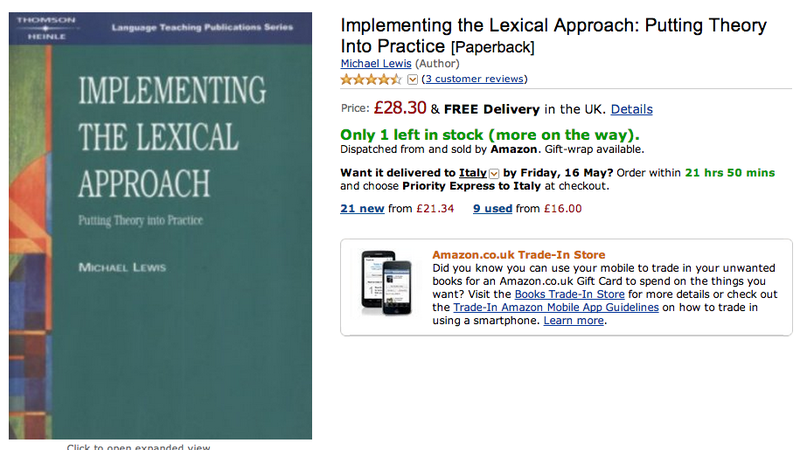 Martin Parrott (Grammar for English Language Teachers), Michael Swan (Practical English Usage)…! Which you choose will be a matter of taste. Ideally, try and have a go at using a few different ones and find one that best suits the way you think. For me, it’s Parrott, but that’s largely because it’s the one I bought and used during my CELTA, and I became rather attached to it! Happy reading! And don’t forget to suggest books that YOU think should be on this list!! 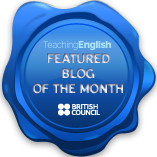 Extending Practice and English Language Teaching specialism (Assessment: An extended written assignment of 4500 words based on your specialism) There is also an English Language Management option. Based on my experience of the Delta, and incorporating the experience of others, it is structured as a Q and A, dealing with questions you might have with regards to each of the above categories as you progress through them and contains links to many handy resources (all easily identifiable with this symbol ) – some of which are mine, some of which are not. I hope it proves a useful resource to refer back to as the questions arise! Q. How can I find out which way would best suit me? TEFL.net have a nice, short FAQ page about the Delta, which also has a link to another page with FAQs about higher qualifications in general. Once you have decided which route to take, you can really help yourself by doing some preparation before you start your course: both in terms of the course content and your own well-being. Q. What should I do before I start my Delta? A. There are a few things you can do, before embarking on this extraordinary journey, to help yourself begin on firm footing. Firstly, look at Cambridge’s How to prepare for the Delta link. You could also think about investing in the latest book to hit The Round’s virtual bookshelves: How to Pass Delta : by the extremely experienced Damian Willians, it is available for a small fee and, I imagine, well worth that investment! Before, during and after the Delta: I wrote this post, based on my experience of doing the Delta. It contains tips to help you stay sane pre-, during- and post-Delta experience. Preparing for the Delta: Sandy provides her top tips for preparing to do your Delta. Well worth a read. Q. That list of books from Cambridge is massive, I don’t know where to start – what should I read first? Q. How DOES the exam fit together? Delta Module 1 Exam: A very handy visual to start with. Q. I’ve looked at the Delta handbook and tried to understand just what it is the examiners want, and I listen really carefully in my preparation classes, but I still don’t really get it. How do I answer the questions the way they want me to? Delta Tips 4: Delta exam paper 1 – tips related to the structure of this part of the exam in terms of what each question requires and the points available, as well as how to approach answering the questions, in terms of laying out the information in an examiner-friendly way. Delta Tips 5: Delta exam paper 2 – as above but for paper 2. Paper One Dale Coulter’s guide to part 1 of the exam, also dealing with structure and answering the questions. Paper Two : As above, but for Paper 2. Q. The exam date is getting nearer, and I really don’t feel ready! How can I help myself revise more effectively? 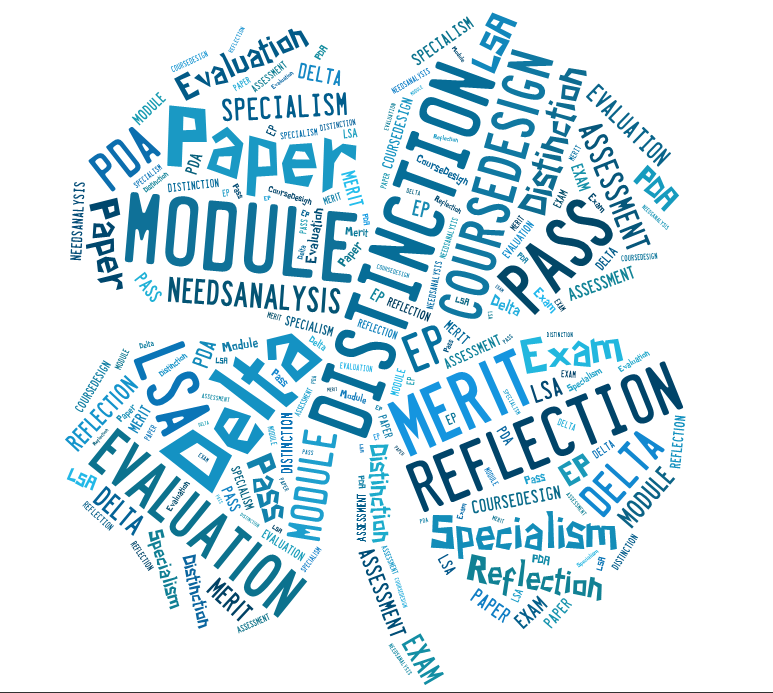 Delta Tips 6: Useful resources for Module 1 revision – a collection of links that will be useful as the exam approaches. Revision chart: A colourful revision chart that I made for the Module 1 exam, this provides a visual aid to help with remembering the structure of the exam and how to lay out your answers. Sandy’s preparation tips: How Sandy prepared for Module 1. Q. You said I should use Quizlet to revise terminology, but I don’t know how?! Q. I have no life! I haven’t since I started this damn course. Is this normal? A. Don’t worry, you aren’t alone! Barry O’Leary shares his journey here. Before, during and after the Delta: has some tips for holding on to your sanity mid-Delta, which can be found in the middle part of this post. Q. I have to write an LSA essay. Hmm. How do I do that? A. First you need to decide which system (grammar, lexis, phonology, discourse) or skill (receptive: listening or reading; productive: speaking or writing) to focus on, which at least initially will probably be influenced by your centre and the running order of their module 2 course. Delta Tips 1 : Writing a background essay for an LSA, which provides some suggestions for getting to grips with this beast. Sandy Millin’s carefully-tagged Delta-related bookmarks may be useful! Q. I’ve survived the lesson (thank God!) but now I need to do the post-lesson evaluation. Where do I start? What should I include? This post, by Tefalump, The stages of a Delta assignment, should be somewhat comforting – it’s normal for Module 2 to make you cry at some point(s)! Q. I still have to do my PDA part A and Experimental Practice. Can’t I just leave them until I’ve sorted out the LSAs? A. It would be much better to get started as soon as possible! The PDA part A is supposed to be done alongside your module 2 work, as it is your opportunity to develop into a reflective practitioner. What you learn while doing your PDA could/should feed directly into your development in your LSA lesson planning and teaching practices. Equally, any weaknesses highlighted in your LSAs could/should feed into your PDA. I found this component of Module 2 very valuable developmentally and would really recommend not putting it on the back burner. Delta Tips 7: Doing PDA Part A offers some tips for getting the most out of your PDA. The Experimental Practice is another valuable learning opportunity: it actually helped me figure out what to do with my PDA (I was slow to catch on! ), and, long term, how to embark on a cycle of reflection, experimentation, evaluation and more reflection. Delta Tips 8: Doing the Experimental Practice offers some tips for getting the most out of your EP. Experimental Practice in ELT by Jennie Wright and Christina Rebuffet-Broadus is available from The Round for a small fee, containing ideas and sample lesson plans suited to the EP as well as to teachers who want to Experiment outside of Delta training. Q. Cambridge wants me to do WHAT? I’m confused… Where should I start? What do they want? What should I read? Hopefully the input sessions on your course will also help you understand what you are supposed to produce, how and when. Q. I’m writing a draft of my introduction now, but I’m not entirely sure if I’m doing it right. How do I fit in everything that Cambridge seem to want? Delta Tips 10: in Writing a Module 3 Essay – the Introduction I offer some tips for how to meet Cambridge’s criteria for the introduction. It might also help if you are still a little hazy about exactly what to include in your introduction. Q. How do I do a Needs Analysis with my students and what should I write in the corresponding essay section? A. The Needs Analysis is an important element of the extended assignment. This is where you take the issues that you pinpointed in your introduction, consider how to assess your learners in order to identify where they stand in relation to these, and identify the areas that your course design will need to focus on. If you put a lot of reading, effort and thought into this section and create your tools very carefully, you will make your life a lot easier in the subsequent sections. A. This is arguably the most time-consuming portion of the extended assignment: You need to produce a 20hr course plan that addresses the priorities you’ve identified, and write about it in such a way that covers everything that Cambridge want to know about it. You may also want to showcase some sample materials that your course uses in your appendices. Q. I’m losing the will to live now – but it’s not over yet <sob>: Apparently I have to do the assessment section next! Help! A. Don’t worry, you’re getting closer to point completion now! And hopefully all the reading up on the literature related to assessment that you did while doing the Needs Analysis section will also have given you a leg up with this section. Besides, by now you will be getting the hang of the writing style (or, at least, it took me this long! 🙂 ) and of Cambridge module 3 hoop-jumping. Q. Hurrah! I can see daylight at the end of this module 3 tunnel from hell! How do I finish this bad boy off?! A. Ok, first of all, the fat lady is not singing quite yet so hold on for a bit longer! The conclusion is short but still important. Don’t dash it off at the last minute… Fortunately, it is a lot less involved than the previous sections and mainly requires good evaluative skills. You are on the home-stretch now!